Group Captain Atul Pant is a Research Fellow at the Military Affairs Centre in the Institute for Defence Studies and Analyses, New Delhi. He is a serving member of the Indian Air Force with 26 years of service. He has served in various capacities in the IAF including instructional tenures and staff appointments at Air Headquarters. 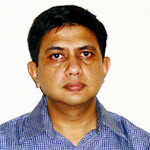 His research is focused on Future Evolution of Warfare in Medium Term and Options for the IAF. National security refers to securing a nation’s citizens, territory, resources, assets, ideologies, institutions, and interests against threats which may emanate from changing geopolitical state of affairs, changing relations between nations, groups, races, sects, advancing technology and changing ideology. In the prevailing complex geopolitical scenario, India’s national security is facing new challenges and acquiring new dimensions with every passing year.